General Electric (GE) Spacemaker washers are available in two models. Each model has a detergent drawer for laundry soap, bleach and fabric softener. The appliance adds each product at the correct time automatically, so the cycle does not need monitoring while in operation. Sort laundry into like articles and place them loosely in the washtub. Close the washer lid. Slide the dispenser door latch to the right to unlock it. Pull the drawer straight out. Add detergent to the compartment on the left, bleach to the center compartment and fabric softener to the right compartment. Slide the drawer in and push the latch to the left. Turn the temperature knob to the right to select the wash and rinse cycle water temperature. The wash temperature is on top and the rinse cycle on the bottom of each selection. Push in the wash cycle knob on the right of the control panel. Turn it clockwise to select the cycle length. Pull the wash cycle knob out to begin operation. 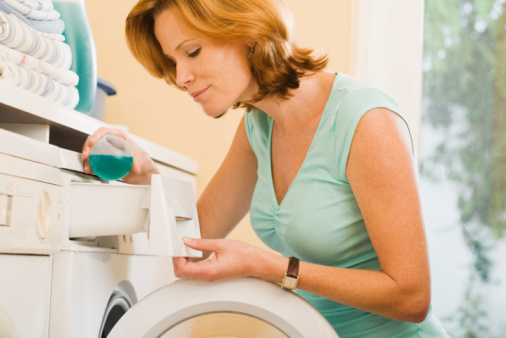 Select the fast spin option for heavier items like jeans so the washer spins quickly and wrings excess water out of them. This saves drying time in the dryer. Turn the extra rinse cycle knob to the "On" position to rinse lightweight fabrics like cottons or linens thoroughly. Turn the signal cycle knob to the right to "Loud" to increase the buzzer indicating the laundry is completed. Turn the signal cycle knob to "Off" to disable the buzzer.